Renewable energy is energy that is regenerative or, for all practical purposes, virtually inexhaustible. It includes solar energy, wind energy, hydropower, biomass (derived from plants), geothermal energy (heat from the earth), and ocean energy. Renewable energy resources can supply energy for heating and cooling buildings, electricity generation, heat for industrial processes, and fuels for transportation. The increased use of renewable energy could reduce the burning of fossil fuels (coal, petroleum, and natural gas), eliminating associated air-pollution and carbon dioxide emissions, and contributing to national energy independence and economic and political security. Before the 1900s, the world as a whole used wood (including wood converted to charcoal) for heat in homes and industry, vegetation for feeding draft animals, water mills for grinding grain and milling lumber, and wind for marine transportation and grain milling and water pumping. By the 1920s, however, coal and petroleum had largely replaced these energy sources in industrialized countries, although wood for home heating and hydroelectric power generation remained in wide use. At the end of the twentieth century, nearly 90 percent of commercial energy supply was from fossil fuels. Renewable energy, however, makes important contributions to world energy supplies. Hydroelectric power is a major source of electrical energy in many countries, including Brazil, Canada, China, Egypt, Norway, and Russia. In developing countries many people do not have access to or cannot afford electricity or petroleum fuels and use biomass for their primary energy needs. For example, most rural people in Africa use wood, scrub, grass, and even animal dung for cooking fuel. Small-scale renewable energy technologies are often the only practical means of supplying electricity in rural areas of these countries. 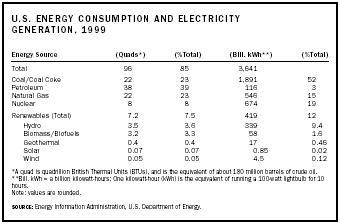 The table indicates the relative consumption of energy sources in the United States. Biomass. Biomass includes wood, agricultural crops and residues, municipal refuse, wood and paper products, manufacturing process waste, and human and livestock manure. 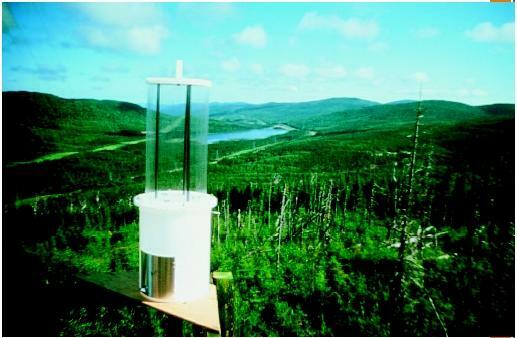 It can be used to heat homes and buildings, produce electricity, and as a source of vehicle fuel. Wood and paper manufacturers and sugar mills use biomass residues for process heat and electricity production. There are power plants that burn wood, agricultural residues, and household trash to produce electricity. Biogas (composed of methane, carbon dioxide, and other gases) produced by decomposing biomass in anaerobic conditions is captured from landfills, municipal sewage treatment plants, and livestock waste management operations. This gas can be used for heat or to generate electricity. Ethanol is used as a transportation fuel in the United States, Brazil, and a few other countries. Nearly all the fuel ethanol in the United States is made from corn, although it can also be produced from other sources, including wastepaper. There is a small but growing consumption of "biodiesel" made from grain oils and animal fats. Geothermal systems. Geothermal energy (heat from the earth) created deep beneath the earth's surface is tapped to produce electricity in twenty-two countries, some of which include the United States, Iceland, Italy, Kenya, and the Philippines. Geothermal hot springs can also heat buildings, greenhouses, fish farms, and bathing pools. Hydropower. Hydropower, produced from flowing water passing through hydroelectric turbines , is the leading renewable energy source, contributing to approximately 9 percent of the electricity generated in the United States. Most hydropower is produced at large dams, although there are many small systems operating around the world, such as the small hydropower plant in Namche Bazar, Nepal, which provides power for the tourist and market town near Mt. Everest. The production of hydroelectricity from year to year varies with precipitation. Ocean energy. The world's oceans are a vast and practically untapped source of energy. There are a few operating wave and tidal power plants around the world, and several experimental ocean thermal energy conversion (OTEC) plants have also been built. A small wave power plant in Norway captures water from waves in a dam and lets the water out through a turbine. A 240-megawatt tidal power facility on the Rance River in France produces electricity as tidal flows move back and forth through turbines located at the mouth of the river. In Hawaii, a small OTEC plan was built which uses the temperature of warm surface water to evaporate cold seawater in a vacuum to produce steam that turns a turbine and generator. to heat water that is stored in a tank for later use. Homes can be heated by using a masonry floor to absorb sunshine coming through windows, or by using solar collectors to heat a large tank of water than can be distributed for heating at night. Concentrated sunlight can be used to produce high-temperature heat and electricity. 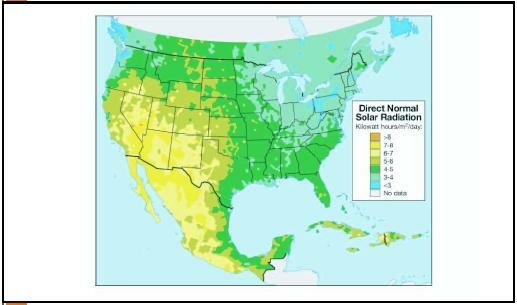 Nine concentrating solar parabolic trough power plants, with a combined generation capacity of 354 megawatts, are located in the Mojave Desert in California. (A megawatt is 1 million watts, or 1,000 kilowatts.) The U.S. Department of Energy built and tested a ten-megawatt solar thermal central receiver power plant near Barstow, California, which operated successfully for about seven years. Another type of concentrating solar thermal power system is a parabolic dish. Systems with a capacity of up to twenty-five kilowatts have been developed. 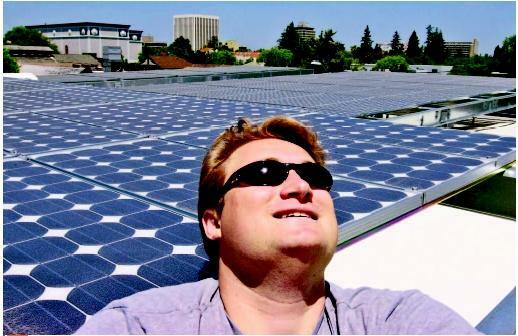 Photovoltaic (PV) systems are based on solar electric cells, which convert sunlight directly to electricity. They can be used to power hand calculators or in large systems on buildings. Many PV systems are installed in remote areas where power lines are expensive or unfeasible, although the number of systems connected to electricity transmission systems is increasing, and range in size from 1 to several kilowatts on houses, to systems over one hundred kilowatts on large buildings. PV systems are very suitable for use in developing countries where people have no electricity from electric power lines. *A quad is quadrillion British Thermal Units (BTUs), and is the equivalent of about 180 million barrels of crude oil. **Bill. kWh = a billion kilowatt-hours; One kilowatt-hour (kWh) is the equivalent of running a 100-watt lightbulb for 10 hours. 2 to 3 megawatts of electricity, with 100-foot (30-meter) blades. They can be installed on land and in shallow water in coastal areas. Renewable energy resources are enormous—hundreds of times beyond the needs of world energy consumption in 2000. Advances in technologies are reducing manufacturing costs and increasing system efficiencies, thereby reducing the cost of energy from renewable resources. Negative environmental and health impacts of renewable energy use are much fewer than those of fossil fuels and nuclear power. Many renewable energy technologies can produce energy at the point of use, allowing homeowners, businesses, and industry to produce their own power. There is strong support for renewable energy from people around the world. Many governments have programs that support renewable energy use to limit the emission of greenhouse gases and thereby reduce the threat of global warming. As fossil fuels such as oil and natural gas become scarce, they will become more expensive. Some experts believe that demand for oil will exceed production capability within the next twenty years. Using energy conservatively and efficiently, no matter how it is produced or where it comes from, is the most economical way to consume energy. Simply turning off lights and computers when they are not in use can save an individual household or business money and reduce the environmental impact associated with producing electricity. U.S. Energy Information Administration. (2001). Annual Energy Review 2000. Washington, D.C.: U.S. Department of Energy. U.S. Energy Information Administration. (2001). International Energy Annual 1999. Washington, D.C.: U.S. Department of Energy. U.S. Energy Information Administration. (2001). Renewable Energy Annual 2000, with Data for 1999. Washington, D.C.: U.S. Department of Energy. Renewable Energy World. London: James & James Science Publishers. Available from http://www.jxj.com . U.S. Department of Energy, Office of Energy Efficiency and Renewable Energy. Available from http://www.eren.doe.gov .